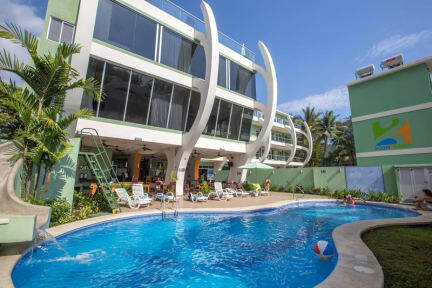 Room2Board Hostel and Surf School i Jaco, Costa Rica : Boka nu! Precis vid stranden, enkelt att hyra surfbräda och gå ner och surfa. Fantastiskt trevlig personal! Honestly we expected way more from this Hostel after reading all the reviews. Indeed the dorms were clean and secure but the place was quite boring and located very on its own. The kitchen was tiny and so was the pool. The staff was nice but there was no atmosphere in the place. Over all Jaco was not a great town.